As Tracy and I plan our launch events and order cupcakes, we’re really hoping you enjoy them and that no one talks about not “deserving” a cupcake or about being “bad” for just one night! 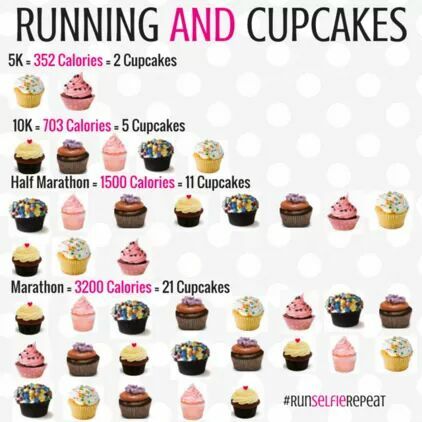 That reminded me of this old post about eating and enjoying cupcakes! Love running. Love cupcakes. But the two, in my life, have no relationship whatsoever to one another. I run for fitness and for the joy of movement. I eat cupcakes because they taste amazing. Turns out my motivation for exercise–it makes me feel great–is a much better, more effective motivation than long term health or weight loss. See Rethinking Exercise as a Source of Immediate Rewards in the New York Times. “Dr. Segar, a psychologist who specializes in helping people adopt and maintain regular exercise habits, is the author of “No Sweat: How the Simple Science of Motivation Can Bring You a Lifetime of Fitness.” Her research has shown that even people who say they hate to exercise or have repeatedly fallen off the exercise wagon can learn to enjoy it and stick with it.